NEW YORK—Despite poor weather predictions, the sun came out for Taste Asia’s inaugural food festival in Times Square Wednesday—as did the masses. Taste Asia is the culmination of a month-and-a-half-long Asian restaurant month, which started in May, the month for Asian Pacific Heritage. Enticed by free food samples and live performances, the draw wasn’t hard. “We did not expect that we were going to sell that quickly,” said Doris Yao, the owner of A-Pou’s Taste, a Taiwanese food cart. She said she sold out of most of her dishes by 1:00 p.m.
Passersby got to try a wide range of Asian flavors from Malaysian to Korean, to Chinese and Thai. While Asian food is well known in New York, what is less well known is how it is made. 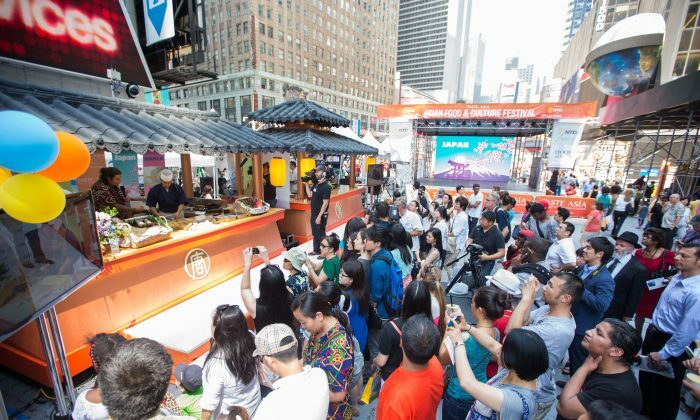 “I have seen Chinese food [made] before and I have tasted it but this is the first time I have seen [Korean food made],” said Tamer Amer, a resident of Brooklyn who was watching the Korean food demonstration. People also got to watch a Japanese Tea ceremony performed by professor Masako Sohga Koike. “I’ve read about it in books but I’d never actually seen one done,” said Jonathan Porch from Monroe. “I would absolutely like to do one someday,” he said. Indian and Korean dancers rounded out the mostly food-related performances, which included noodle- and mochi-making demonstrations, a dumpling-eating competition, and beginners’ lessons on how to eat with chopsticks. Taste Asia will continue on Thursday with the spotlight on Chinese cuisine. The top contestants from the categories of Cantonese, Sichuan, Northeastern, Huaiyang, and Shandong will compete for the gold in New Tang Dynasty Television’s 6th annual Chinese culinary competition. Taste Asia is presented by NTD Television and Epoch Times. For more information, go to TasteAsia.org.